The Washington Examiner reported Thursday that Rep. Ilhan Omar (D-MN), whose open hatred of Jews should have rendered her unelectable to Congress, has instead been rewarded with a plum appointment to the House Foreign Affairs Committee. This shows the extent to which open anti-Semitism has become mainstream and normalized on the Left today. 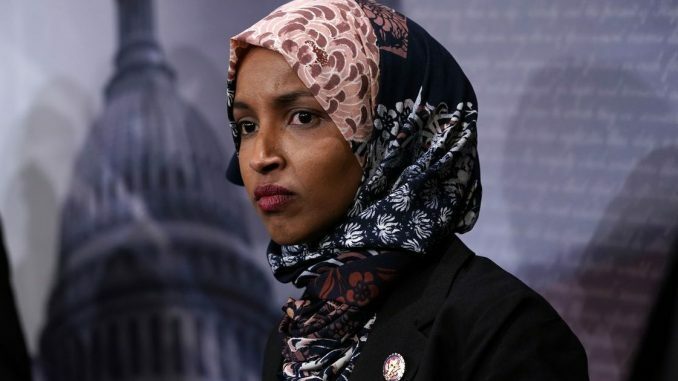 In fact, it is likely that Omar’s paranoid hatred of Israel, rooted in Islamic anti-Semitism, made her a good candidate for this position in the eyes of Democrat leaders, who have been following a consistent anti-Israel line for years. Omar does indeed represent an “anti-Israel section of the Democratic Party,” it is by no stretch of the imagination a “fringe,” at least not anymore. It is mainstream in the Democratic Party, and not just mainstream, either: it’s the future. But Leftists rarely have to answer for their corruption, and so in the new Democrat House, Omar is being rewarded rather than censured and investigated. She and her fellow Muslim Congresswoman Rashida Tlaib will also enjoy establishment media accolades as they pursue their hard-Left, anti-American, anti-Israel agenda. Their presence in the House of Representatives may be evidence of “diversity,” but it is also a disquieting sign of the continued dominance of identity politics, and the increasing balkanization of the American body politic. Forthrightly pro-America, pro-Israel candidates would stand little to no chance in either of their districts. And that is indicative of a much larger problem.